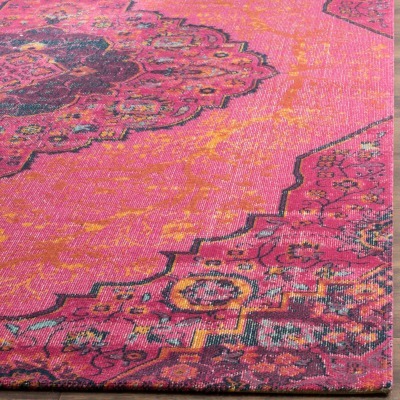 Brighten your kitchen with a colourful, bold rug. 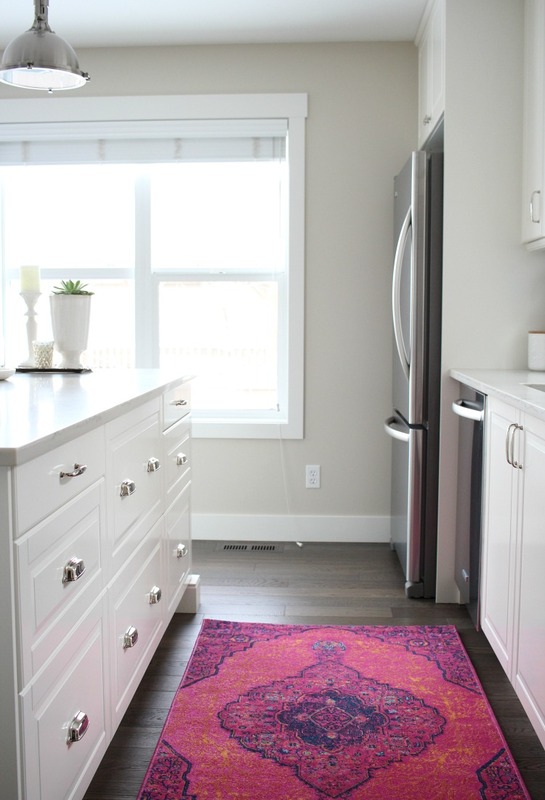 I’ve rounded up some of my favourite kitchen rugs and runners for less. A couple months ago, I decided it was time to start playing around with colour again after living with our neutral kitchen for the past few years. Sure, I’ve added pops of colourful decor from season to season, but when it came to larger decor choices, including a kitchen rug, I usually played it safe. Between our island and sink area, a rug is necessary. First off, it saves the hardwood from general wear and tear. It also provides a bit of cushioning since we stand in this area prepping and cleaning up frequently. The last reason, and probably my favourite, is the softness and prettiness it adds to our kitchen. 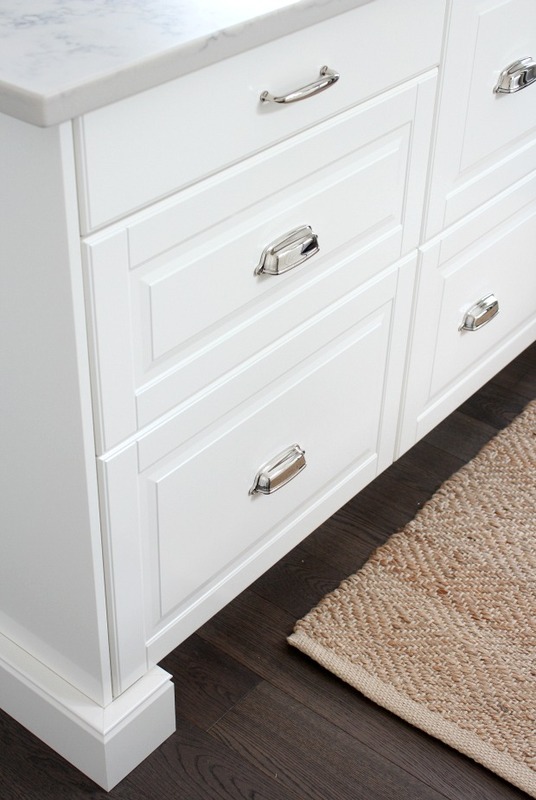 After our kitchen renovation was completed, I started out with a natural woven jute rug. It added texture and cozied up our kitchen, but it didn’t take long to realize it wasn’t the best choice. Unfortunately, it constantly shed (which you can see against our darker hardwood) and was difficult to clean. Maybe a bit on the boring side as well? Some links in this post are affiliates for your shopping convenience. See my blog polices here. 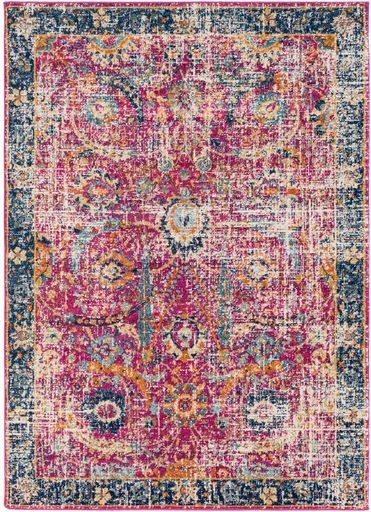 While searching for a better option, I came across this patterned indoor/outdoor rug by Dash & Albert. 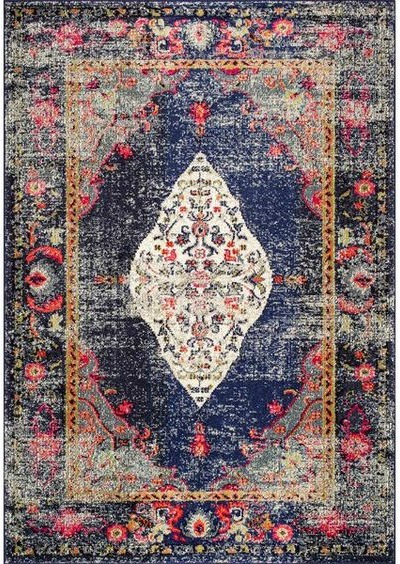 The idea of having a rug that could stand up to everyday wear (read the reviews), plus add some interest to our kitchen, made it an easy choice. 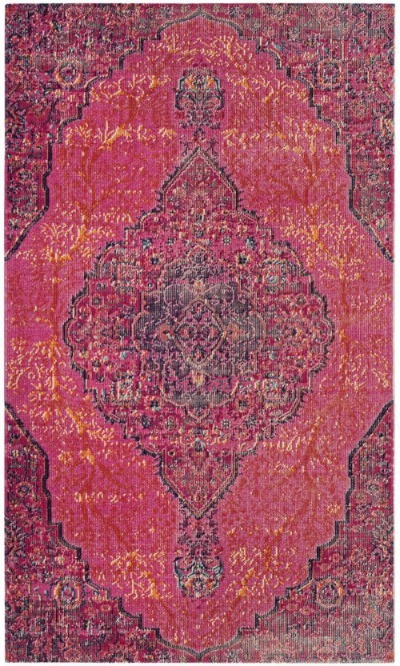 And when I say durable and resilient, this Samode rug is just that! We used it in our kitchen for over 3 years (a simple dunk in the bathtub or wash down with the hose outside is all that was needed to keep it looking brand new). Currently, I have it rolled up in our basement storage room until I’m ready to use it again. I’m sure I’ll have it for many more years, so definitely worth the investment. Why change our kitchen rug? 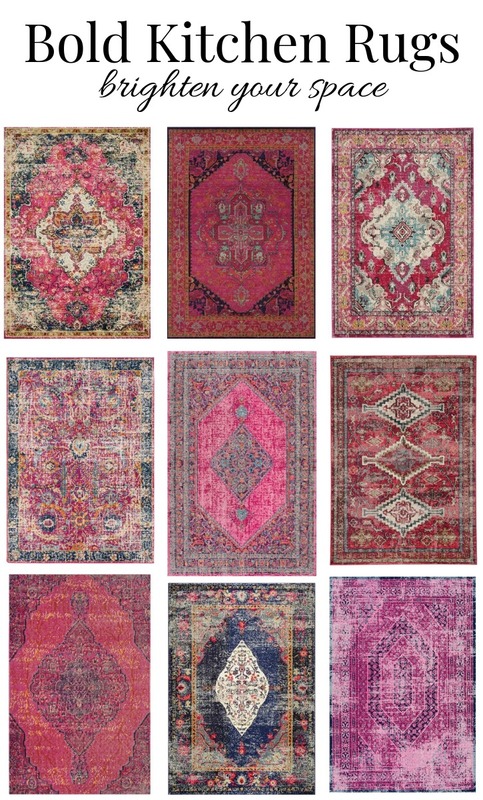 For months, I’d been admiring pictures of kitchens with bold rugs. Scrolling through Instagram or Pinterest, bold patterned rugs in kitchens stopped me dead in my tracks. 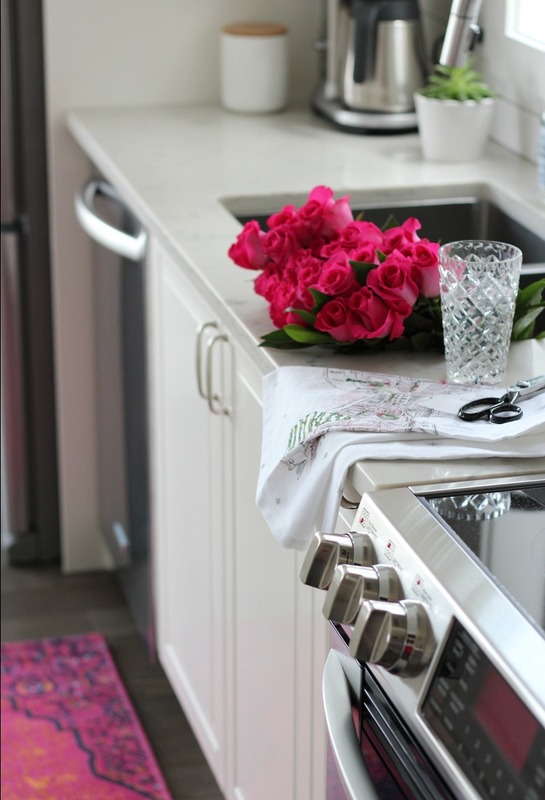 It seemed like I was drawn to bright pink rugs similar to this kitchen. After saving more of these pretty kitchen photos than I could count, I decided to finally hunt one down. When it comes to decor that’s on the trendy or “put myself out there” side, I always buy it on sale or at a great value price point. That way if I grow tired of it, I feel no remorse. I also pick out new decor that ties in with our basic colour scheme throughout our house. In this case, our main floor is mostly neutral (white, off-white, grey and black) with shades of blue and green. 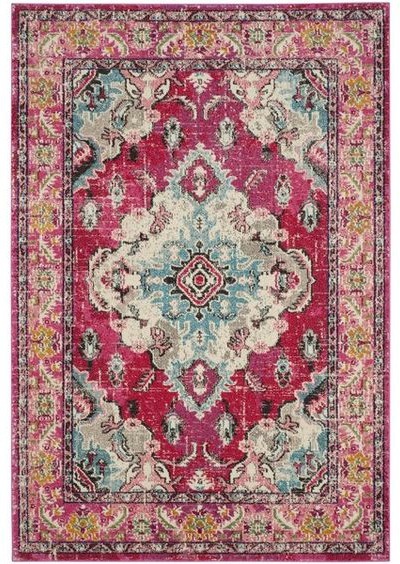 So, the rug had to have at least a hint of those colours in order to be a contender. 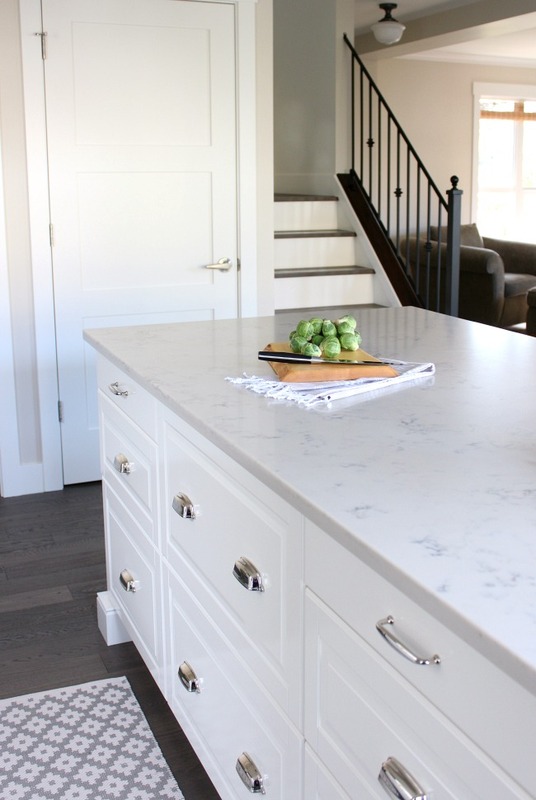 The size that works best in our kitchen is 3 x 5. Runners are often a good choice too, but I prefer the extra width to protect the hardwood floor from drip marks. This really depends on the layout of your kitchen. 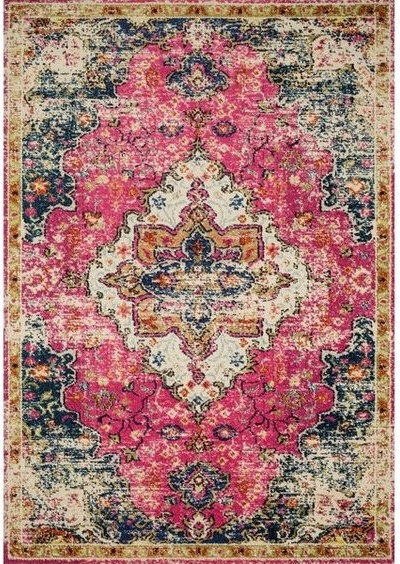 This pink patterned rug is also available at Home Depot. It’s definitely a bold choice (shocking at first), but I love how it wakes up the space. I find it warms up our kitchen and, strangely enough, I even enjoy working in this area more. I love the bright pretty rug you selected. A pop of color is so pretty. Pinned. The rug is beautiful loved the color I like to know where did you buy your kitchen sink. Hi Margie, It’s the Hana ER sink by Pearl. We purchased it at a local shop. You can see more kitchen details here.